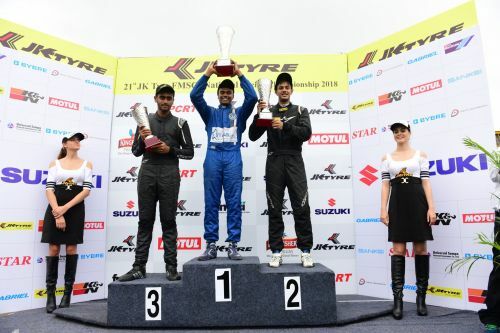 Coimbatore, July 8: Sri Lanka’s Bryan Perera made the most of slightly wet conditions to emerge the star of the day, winning two Euro JK 18 races in the 21st JK Tyre FMSCI National Racing Championship here on Sunday. Mumbai’s Nayan Chatterjee stayed right behind the leaders by making the podium thrice on Sunday, grabbing the second place twice and the third place once. Another Chennai racer Ashwin Datta enjoyed a good run, finishing second in Race 4 and third in Race 2 and 3. In fact, Ashwin Datta has taken top position on the leader-board with 24 points, upstaging Perera and Tharani who have accumulated 23 points. Nayan has 20 points. The LGB 4 too proved to be a tantalising affair, with Delhi’s Rohit Khanna and Chennai’s Raghul Rangsamy winning one race each. Chennai’s Vishnu Prasad had won Race 1 on Saturday, to produce three different winners in the three races in this category. Vishnu and Kolhapur’s Chittesh Mandody took the second and third places in both the races to pick up valuable points. Vishnu, however, is ahead on points after Round 1 with 22 in his kitty. Raghul and Rohit have 21 and 17 points. 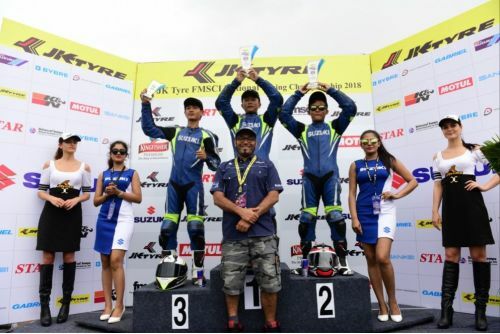 In the Suzuki Gixxer Cup, Joseph Matthew continued his imperious run, remaining unbeaten over this weekend too. He finished the 10 laps in 14:16.799 minutes, recording his quickest time of 1:23.411 minutes in Lap 6 for his second straight victory. Syed Muzamil Ali (Bengaluru) and Malsawmdawngliana (Aizawl), who had finished third and second last evening, swapped places in Race 2 to finish on the same number of points. A carnival-like atmosphere reigned at the Kari Motor Speedway, with a big holiday crowd turning up to enjoy the Race Day. Music, stunts and close races marked the day, as the competitors gunned for glory. The Ahura Racing team once again were greeted with the loudest cheers, with the five girls in red tackling the wet conditions with elan. The slippery track didn’t deter them, leading to a series of photo-finishes in all the categories. Bryan Perera recorded the day’s fastest lap in Race 3, taking just 1:00.279 minutes in his Euro JK 18 car.